You probably thought for half a second that I got a new doll. I mean, look at her, she’s looks so sleek and fresh and new that if you have followed my blog for a while now, you are truly sure you’ve never seen her before. But she sure does look kinda familiar, no? Well, meet Tessa - a vampire I turned into a human earlier this morning. She’s been the Contessa who’s modeling for me for more than two centuries, I mean, years now. But in between those shoots, I really didn’t know what to do with her. I initially planned my period clothes with her in mind, but I couldn’t just resist what I felt was a necessary thing for me to do, just a few hours ago. And I’m glad I did it. And here she is, in her new bob. I think it suits her edgy makeup. What do you think? 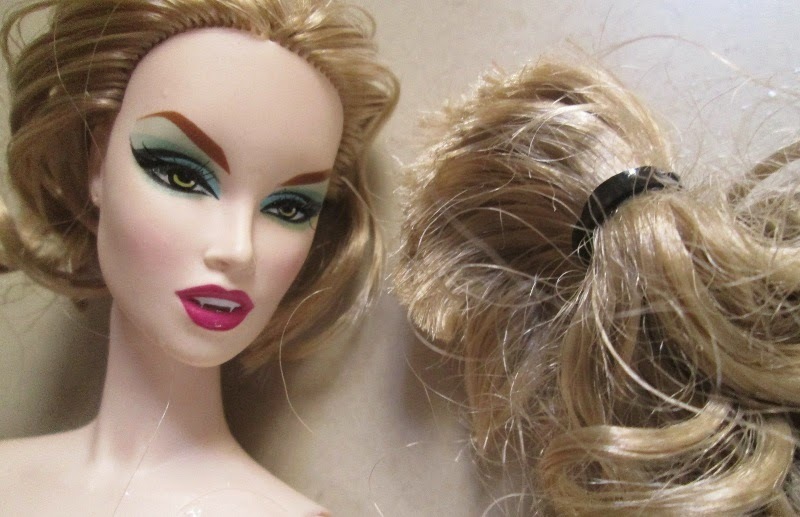 ‘Would love to hear about your own story of cutting your doll’s hair. Last time I did this was when I was 10 haha! Way to go! I love her new look. I am such a fan of short haired dolls, and we don't see them too often. Love her. Oh, Van.. same here. I have a short-haired Momoko and Eugenia but I still can't get enough! They're just too cool! She does look GREAT!! I have a doll that is suppose to be my muse but she want to hang out with the other ladies. I might have to give her a new look and and a new lease on life.